An Introduction to Surgical Hair Replacement: For those men and women who are searching for a permanent, natural solution to hair loss, surgical hair transplants may be the answer! Over the years, many different methods have been used to replace lost hair, including wigs and hair weaves. Although these techniques may hide hair loss, they are not the same as real hair. Even worse, none of these alternatives are permanent and they all involve continual upkeep and expense. Surgical hair transplantation is recognized by the medical community as the only safe and effective way to permanently restore healthy, living hair to balding and thinning areas of the head. Once it has taken root, tansplanted hair is just the same as the other hair on your head. It can be washed, cut, colored, combed and styled in any manner you want! And, most importantly, it will continue to grow for the rest of your life! A: Common baldness, known as male or female pattern bladness (MPB/FPB), is the most typical cause of bald spots, receding hairlines and thinning hair in both men and women. MPB/FPB is an inherited condition. Q: What are hair transplants and why do they work? A: Most people, even if they are severely bald, have permanent lifetime hairs. Hair transplantation involves taking permanent hairs, usually from the back and sides of the head, which is called the "Donor Area," and redistributing the over balding areas. These redistributed hair follicles, which have been genetically programmed to grow where located, take root quickly and continue to grow for life. Q: Does the donor area become bald? A: No. After the graft is removed, the donor site is closed in a cosmetic fashion so that only a linear line remains which is easily covered by surrounding hair. Q: How soon will transplanted hair grow? A: Within about three weeks, transplanted hair falls out. Then about three months later, the hair STARTS TO GROW and continues to grow at the normal rate of about one-half inch per month. Q: How many procedures will I need? A: This varies from patient to patient, depending mainly on the size of the bald area and the number of grafts transplanted during each procedure. The number of grafts you'll need can be estimated at the initial consultation. A: Hair transplantation involves a series of operations in which a narrow strip of hair is removed from the back of the head (where hair grows thickest), divided into grafts containing from one to six hair each and implanted on the top of the head or other balding areas. Mini-grafts usually contain three to six hairs each, while micro-grafts contain one or two fines hairs. A skilled surgeon uses a combination of mini- and micro-grafts to fill thinning and balding areas on the scalp to create a soft, natural-looking hairline. A: First, the back or sides of the scalp are anesthetized with the use of a special anesthetic. The desired number of grafts are then harvested (removed) with a special instrument. Next, the bald area is anesthetized and tiny openings are made to make space for the grafts. Q: Is this a painful procedure? A: The use of the special anesthetic permits painless removal of grafts. After the operation, patients rarely have any actual pain. Some people may experience some discomfort, but it usually mild and can easily be relieved with Tylenol. Q: Will it be obvious that I've had a hair transplant? A: Advances in technical and artistic techniques have made it possible for us to recreate attractive, natural-looking hair. If the procedure is done correctly, your new hair will be virtually impossible to distinguish from the other hair on your head. The results that can be achieved today are very different than those of just a few years ago. In the past, people who had hair transplants often ended up with heavy plugs of hair spaced apart like rows of corn. These results were unattractive and very noticeable. Q: Can I adopt a variety of hairstyles? A: Once your hair has grown to a sufficient length, it can be styled in any manner you choose! It can be cut, colored, combed, curled, brushed, styled and washed just like the rest of your hair. Selecting a hair stylist familiar with hair transplantation is very important. The right hairstyle can make a good transplantation look even better! . Q: Will my insurance cover the operation? A: In most cases, it will not. 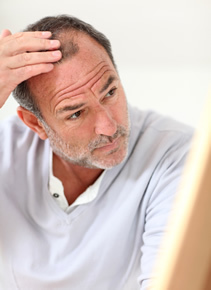 In some instances, such as when loss of hair resulted from an accident, insurance may help cover your cost. Q: Are there any risks involved in the operation? A: Yes, as in all surgical procedures, complications are possible. However, they are infrequent and usually minor. Bleeding, poor hair growth and infection have all been reported. Although rare, these problems improve over time.